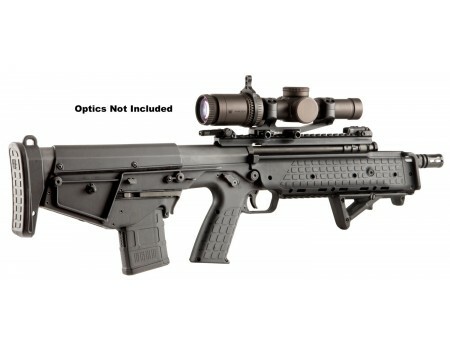 Kel-Tec's RDB bullpup design provides a compact, well-balanced rifle featuring a revolutionary downwards ejection and fully ambidextrous controls, enabling it to be fired from both the dominant and non-dominant side. The result is casings eject out of your line of sight for a truly ambidextrous, high performance rifle. The RDB maintains a center of gravity over the grip assembly to facilitate ease of handling and balance. It comes equipped with two integral MIL-STD-1913 Picatinny rails, located above the barrel and on the handguard for mounting accessories and multiple sling attachment points compatible with a hook-style swivel. It is compatible with AR-15 style magazines.This RDB model has a 17.3" barrel and a black finish. It includes a 20-round magazine. NOTE: Scope is not included. This product may be restricted for sale in California, Colorado, Connecticut, Massachusetts, Maryland, New Jersey, and New York. Please contact your FFL or email us at support@centerfireguns.com before purchasing to verify product restrictions.